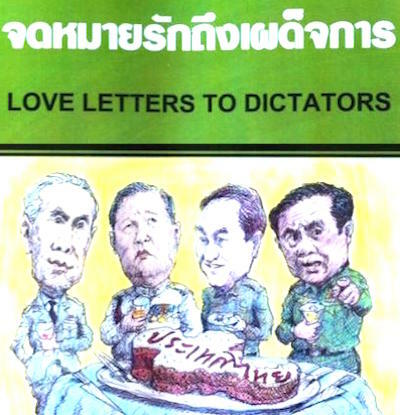 In his ironically-titled Love Letters To Dictators, Sulak Sivaraksa gives his views on the aftermath of the 2014 coup, the NCPO's administration, and Prayuth's "bring back happiness" propaganda campaign. He praises the UDD: "Many Red Shirts are not pawns of Thaksin Shinawatra. They have bravely struggled for freedom", and he condemns the "corrupt policies of Thaksin and Yingluck". The limited edition book is published in both Thai and English. 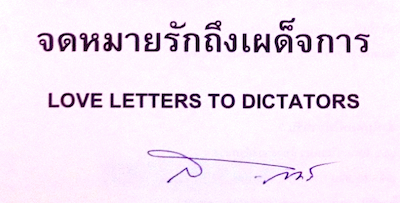 Sulak quotes former Prime Minister Praya Pahon's letter of resignation: "I realized that I am army chief as well as prime minister, it appears improper and... will disgrace Your Majesty", and suggests that Prayuth should take heed. (However, Prayuth has since become Prime Minister.) He notes that there was a change in protocol following the coup, such as the ex post facto royal endorsement, "to show that there wasn't any connection between the monarchy and the coup". But then he adds provocatively: "Whether or not this is plausible is entirely a different matter." Sulak, publisher of Seeds Of Peace, is one of the few Thai intellectuals to speak openly and frankly in favour of democracy and freedom of speech, and against the lèse-majesté law. Sulak himself has faced several lèse-majesté charges over the years, and his book ค่อนศตวรรษ ประชาธิปไตยไทย was banned after the previous coup. When he was interviewed by Same Sky, the journal was banned, though the interview later appeared in his English-language book Rediscovering Spiritual Value. Another Sulak interview, in the documentary Paradoxocracy, was censored before the film's release.